I have had several requests to share this recipe, so I thought I would make a little blog post for it. 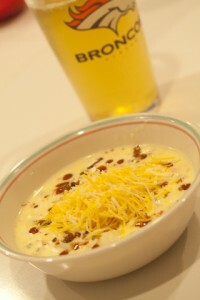 I started making “Sweet Corn Soup” when Wade and I got married. The original recipe came from a sort of ‘cooking for dummies’ kind of book. I made it just like the book said for quite a while before realizing that adding potatoes would make it a sort of chowder. Yum! 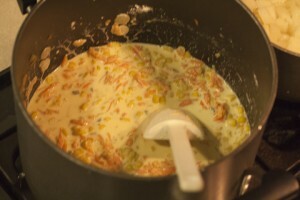 I continued with “Corn Chowder” until I visited Georgia a couple of years ago and had an amazing Shrimp Corn Chowder at Taqueria del Sol in Decatur. I sincerely wished that I could replicate that recipe, but didn’t know how! A happy accident this past fall showed me the way. I believe that the recipe that I am about to share with you comes very close to the deliciousness that is the Shrimp Corn Chowder at Taqueria. 2. Heat butter in soup pot until melted. 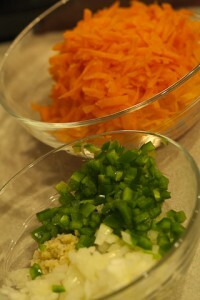 Add onion, jalepeno, and garlic and saute for 2-3 minutes. 3. 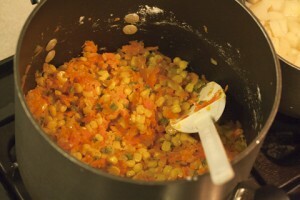 Add frozen corn and grated carrots and cook until corn is tender. 4. Add sugar and stir. 5. (for this next part, I find that it is best to have the heat on Medium so that the roux does not burn) Sprinkle half of the flour over the mixture and stir lightly. 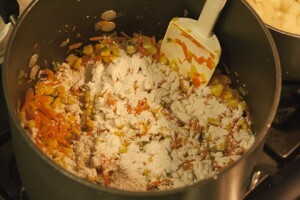 Add the other half of the flour and stir until well incorporated. 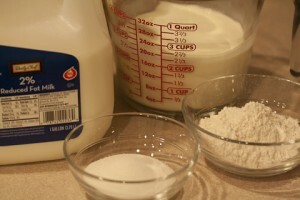 Mixture will be thick, but be careful not to create big, mushy flour lumps. 6. 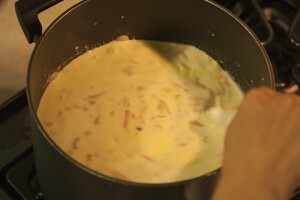 Add cream while stirring until completely incorporated. Add the potatoes. 8. Add salt and pepper to taste and turn heat up no higher than med-high. Bring to a boil. 9. Reduce heat and simmer for 10 minutes, stirring frequently. Add shrimp and cook for 5-10 more minutes. I hope that is everything! Of course, if you have questions don’t hesitate to ask. Enjoy! !